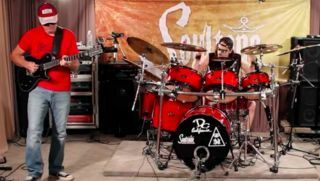 Listen to Former Megadeth Members Nick Menza, Chris Poland and James LoMenzo Play "Wake Up Dead"
The previously unreleased recording dates to a 2014 rehearsal for an unnamed project. Drummer Nick Menza, who played on many of Megadeth's most classic albums, died after he collapsed on stage during a show. He was 51.